It looks too incredible to be true. The internet was abuzz yesterday as a photo of a weasel on a woodpecker’s back spread like wildfire. Amateur photographer Martin Le-May captured the moment near his hometown in Essex, in the United Kingdom, and shared it on social media. 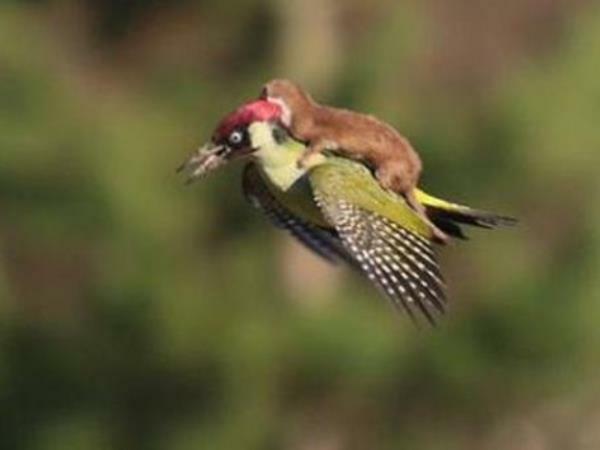 Although it looks as if the weasel is trying to catch a free ride on the bird’s back, bird experts say it was actually attacking the bird, which flew off with the weasel on its back. The woodpecker landed a short distance away and the weasel disappeared into the long grass. Initially people thought the picture had been manipulated, which Le-May strongly denied. But that didn’t prevent internet users from turning the picture into amusing memes. The key word #weaselpecker was spread widely on Twitter yesterday. Here are a few of the amusing manipulations jokers came up with.